Melt filtration is a requirement for most any extruded product and filtration equipment can have a significant impact on the production line efficiency and end product quality. At EAS, we have experience in all types of filtration, but our specialty is with continuous filtration and backflush. Single and dual piston screen changers, continuous belt and rotary types for constant pressure and large area systems for high outputs and very fine filtration are all areas of in depth expertise. Sizing, selection and training are all very critical issues for the successful installation and operation of these systems. We can evaluate any extrusion process and recommend whatever type of filtration technology that is best suited for the application. 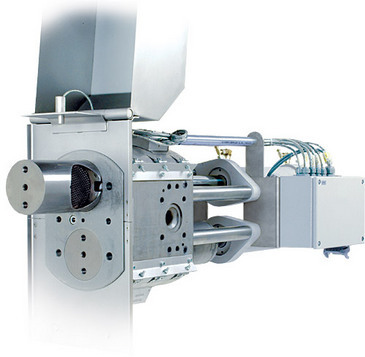 Continuous filtration can greatly improve the efficiency of an extrusion line. Higher reclaim use and finer filtration can lower cost and improve product quality. Payback on these systems is typically a few months, based on increased production alone. Please respond below for a detailed quote, or give us your specific needs, and we will find the right screen changer for you. All systems are subject to prior sale. Now we are able to source spare parts and repair services for most major brands of slide plate and piston style screen changers. Just provide the details on your machine, (model number, serial number, manufacturer, etc.) and EAS will find the right parts and repair services at the best price and delivery available. click here to download "Filter Types" product overview. click here to download technical paper "Screenchangers vs. Large Area Filtration"
Request a quote for spare parts or repair services.